Are Southern Homes Really Less Clean? Theee north/south divide is nothing new. Neither is the reputation of southern homes being less clean than their northern counterparts. But is there any firm evidence for the common conviction that homes in southern regions of the UK are more likely to be dirty? Or is the story about the northern cleanliness and southern uncleanliness just an urban myth? According to the results of a nationwide survey by London Cleaning System in conjunction with Journalistic.org, the average time spent cleaning home in the UK is 4 hours and 31 minutes. But the further north you go, the number of hours spent cleaning tends to increase. In Scotland, the average cleaning time exceeds 5 hours a week. With an average cleaning time of at least 4 hours and 50 minutes a week, homes in North East, Yorkshire and the Humber, Northern Ireland and East Midlands are almost as shiny and spotless as those in Scotland. They are followed by Wales, West Midlands and North West with a minimum cleaning time of 4 hours and 20 minutes. Towns and cities in South West, South East, Greater London and East of England were found to be the least enthusiastic about cleaning, spending 4 hours or less a week scrubbing the toilet, vacuuming the carpets, mopping the floor, etc. Please include attribution to London Cleaning System with this graphic. A closer look at individual UK towns and cities reveals that with a few exceptions, the average time spent cleaning home largely corresponds with the average of their respective regions. So if the average cleaning time of the region is below the national average, the largest towns and cities in that region are highly likely to fail to reach the national average as well. In contrast, towns and cities of the above-average regions are more likely to exceed the average as well. Of the 20 places that were in the centre of the research, 12 failed to reach the average time spent cleaning home in the UK. With the exception of Liverpool which was 11 minutes short of the national average, all the remaining towns and cities belong to the regions that were below the national average. Of “The Dirty Dozen”, Luton was found to spend the least amount of time cleaning, with more than 50 minutes below the national average. Compared to the cleanest of the cleanest, being Aberdeen, Luton homes are on average getting 95 minutes or 30.2% less attention than those in Aberdeen. Besides the formerly mentioned Liverpool, Birmingham also nearly missed the national average, falling short by 11 minutes. Other towns and cities were at least half of an hour short of the national average. Of the 8 towns and cities that exceeded the average time spent cleaning home in the UK, Aberdeen was found to be the cleanest of them all. With the average cleaning time of 5 hours and 15 minutes a week, Scotland’s third most populous city exceeded the national average by as much as 44 minutes. Other places, however, don’t lag far behind either. Glasgow and Edinburgh homes get on average only five minutes less attention. They are followed by Leeds, Belfast and Newcastle which are also within the 5 hour range or very close to 5 hours. In contrast, Manchester and Cardiff exceeded the national average by less than 10 minutes. It isn't just the Southerners who are not fond of cleaning their homes. A comparison with the time spent cleaning home in the 1950s reveals that British homes are getting less and less attention. Both in the north and south! Just a half century ago, British housewives spent more than 40 hours or according to some sources, more than 50 hours a week to keep their homes clean and tidy. This, however, doesn't mean Britons became less thorough when it comes to home cleanliness and hygiene. There are two main reasons for the decline of the time spent cleaning home. The first is the introduction of modern technology which has dramatically cut the time needed to meticulously clean our homes. For example, a 1950s housewife spent about 7 hours a week just to do the laundry because in the early 1950s, less than 5% of British households owned a washing machine. The second reason why women in Britain spend only a fraction of the time their mums and grandmums spent cleaning and maintaining home is the fact that men help out more around the house than they used to back in the 1950s. However, household chores are still unequally split and most of the cleaning continues to fall on women. Where Does London Fit into the Story About Northern Cleanliness and Southern Uncleanliness? To answer the question where does London fit into the story about northern cleanliness and southern uncleanliness, the London Cleaning System and Journalistic.org also conducted a survey in the UK capital. 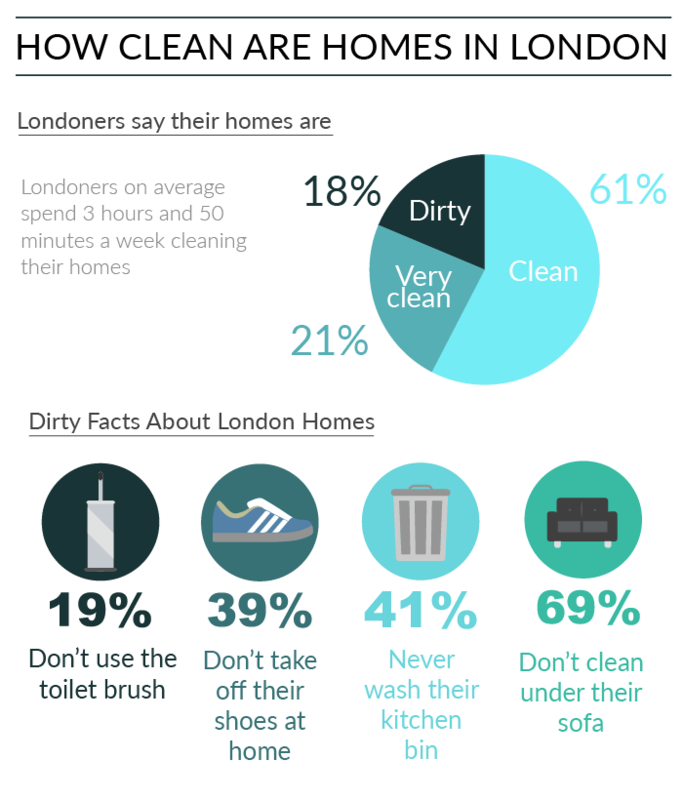 The survey focused on the time spent cleaning but London households were also asked some additional questions in order to determine the actual cleanliness of London homes. Some variation was found between different boroughs, however, the overall result is more or less consistent with the findings of the nationwide survey, namely that home cleaning isn't among the top priorities in the south of the UK.